Raam Bhagvan is the seventh incarnation of Vishnu Bhagvan. He is fair in complexion and was born to Raja Dasaratha and Rani Kausilya. He is the eldest of four brothers, Bharat, Lakshman and Shatruhan. Shri Raam is often pictured with his wife Sita Maa, brother Lakshman and Hanumanji. When pictured alone, he is easily recognizable by the bow that he carries. 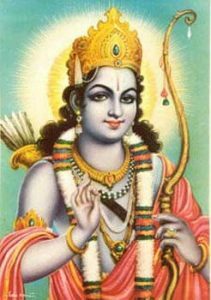 The life and acts of Shri Raam is capture and retold in the Ramayana which is one of the most popular Hindu scripture. In this Holy Scripture he is identified, as an ideal son, brother, husband, friend, ruler and man. He is favored among many Hindu’s for his humbleness, yet overwhelmingly positive actions. Why should he whose dwelling is beneath a wish-yielding tree suffer pain born of poverty? Bearing this in mind, O Lord with the crescent moon on the forehead, dispel the sore confusion of my mind. Lord Shiva then begins to related the glories of Bhagavan Raam by reciting the Ramayana. It has been stated that within this sacred Hindu scripture, a man can find all the answers to mans problems and situations in life. Shri Raam was born into a kingdom full of riches. He had everything at his command. Anything the he wanted he could have easily acquired. But this gracious Lord, Shri Raam, did not come into this world to be attached to worldly riches. He came for the purpose of Dharma (to restore righteousness). In order to destroy the demons within the world he had to leave his kingdom of Ayodhya. He gave this up so that he could have gone to vanvaas which is the forest regions (without any materialistic attachment) for the welfare of the entire world.